Just like it has for most of the season, South Shore received contributions from multiple offensive weapons, helping to propel it pass JFK, 35-13, Friday at home on senior night. The victory kept the Vikings’ undefeated record in tact in the PSAL’s City Conference. Head coach Matt Ciquera, although South Shore hasn’t lost all season long, took the win in stride. South Shore’s coaching staff goes over game plan while break in the action. Junior signal caller Jason Martin led the Vikings’ offense—which amassed 446 yards—by completing 11 of 19 attempts for 212 yards with three touchdown passes, with seniors Michael Watson (2) and Willerm Greffin (1) on the receiving ends. Senior running back Omar Jarrett contributed 88 yards on ten touches with two scores while senior kicker Azeez Ahmed made all five of his extra point attempts. 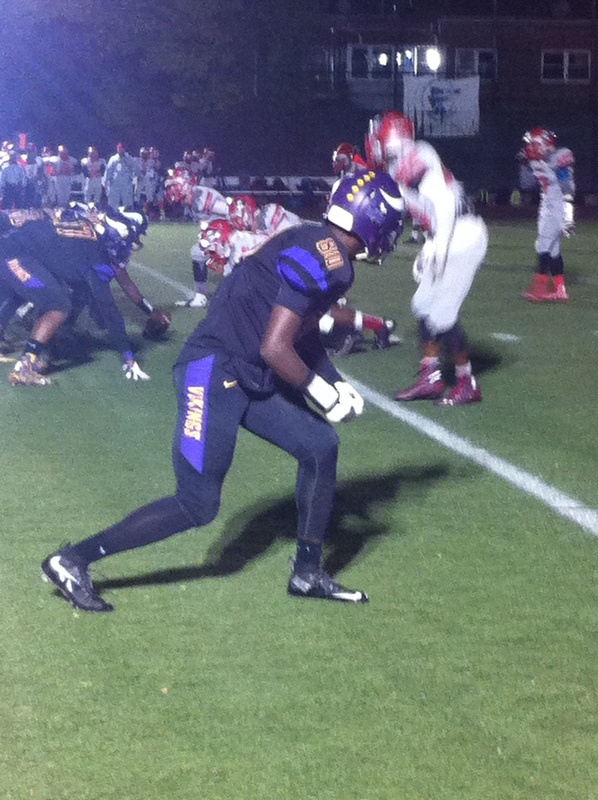 Defensively, Ahmed and junior Denithson Romulus recorded seven tackles each, with the latter registering a sack. The Knights (2-5) opened the scoring early in the first quarter for a 6-0 lead. But South Shore (7-0) responded when Martin connected with Watson on a receiving touchdown pass to take a 7-6 advantage late in the first period. Martin added a 23-yard TD throw to Greffin to extend the Vikings’ advantage to 14-6 midway through the second quarter. After a slow start in the first half, Jarrett ignited the offense when he ran over a JFK defender en route to a four-yard TD run that widened South Shore’s lead to 21-6 early in the third quarter. Running back Omar Jarrett gets a well deserved break after a two touchdown performance in last week’s 35-13 win over JFK. Jarrett believed the Vikings needed a spark, so he took it upon himself to lead by example. Martin displayed his arm strength, and accuracy, when he hooked up with Watson on a 75-yard TD bomb, swelling South Shore’s advantage to 28-6 with 3:41 remaining in the third quarter. Jarrett capped the Vikings’ scoring on a 25-yard touchdown bolt up the middle midway through the fourth period. JFK did add a second score, a 28-yard run, with 0.27 left in the tilt. Ciquera recognizes that South Shore is unbeaten through seven games against lower ranked teams. So, the coaching staff does it best to keep things in perspective while keeping the team modest. The rest, he noted, will take care of itself as the Vikings drive toward a championship goal. 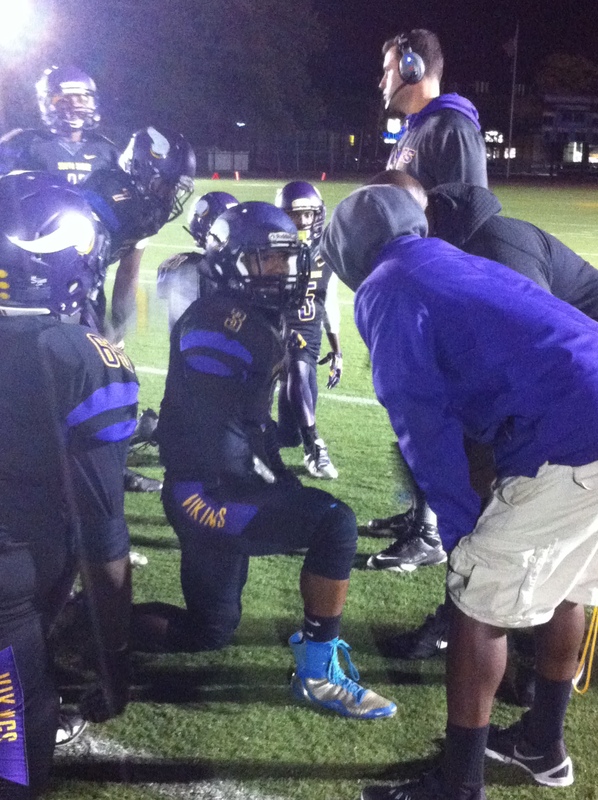 South Shore receiver waits to run out for play. “Even with the win today, our opponents only got seven combined wins as of right now,” he said. So, as a coaching staff, we’re humble right now, in terms of the teams we’ve beaten. No disrespect to anyone we’ve played, but we know we haven’t played the elites yet. 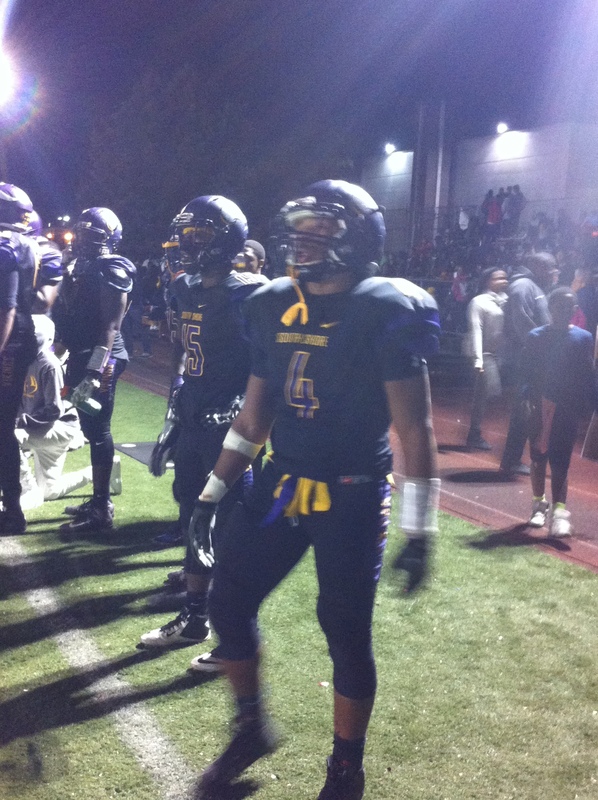 The Vikings host Canarsie Friday at 7:00 p.m. in the neighborhood bragging rights trophy game.